Warehouse layout directly affects the efficiency of any business operation, from manufacturing and assembly to order fulfillment. Whether you’re planning a shipping operation or designing your space around manufacturing or assembly stations, a sound layout is essential. By the end of this guide, you’ll have the tools you need to create a detailed warehouse schematic. If running your own warehouse is too cost-prohibitive, you can outsource your storage with a third-party fulfillment provider. ShipBob is a small business fulfillment service with a nationwide warehouse network that puts your stock within a one- to three-day shipping time to most U.S. locations. You just pay a flat fee for storage and receiving plus a combined fulfillment fee based on the goods you ship, average order size, and overall volume. Get a free quote today. We’ll walk you through every step of the warehouse layout and planning process, from space utilization and storage options to aisle layout and production area workflows. We’ll even look at sources for different types of warehouse shelving and other key equipment you might need. If you need help with organizing your warehouse inventory, check out our guide to small business inventory management. Now let’s take a look at the first step in warehouse layout planning: Getting it down on paper. 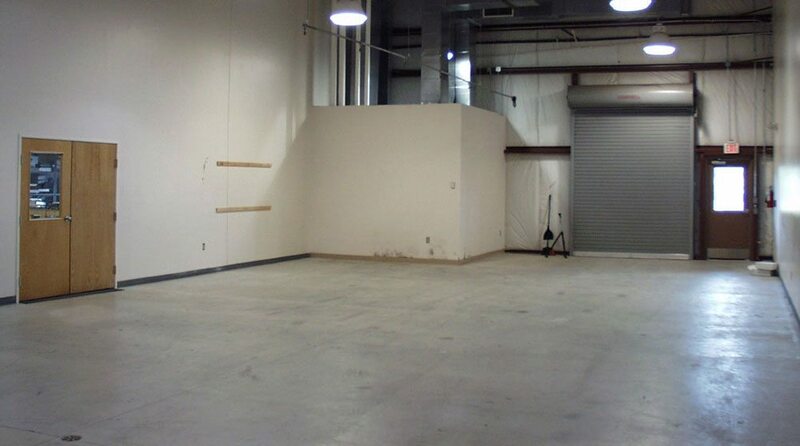 Your new warehouse space is a blank slate. How will you transform it into a productive workspace? A good warehouse layout always starts with putting it all down on paper first, no matter the size of your space. The easiest way to do this is to use a copy of your warehouse blueprint, especially if your space is large or not a standard rectangle shape. If you’re renting, your landlord might be able to provide one. You can also use a computer program to create your warehouse layout schematic. To create the images shown here, I used Inkscape, a free graphic design program with an optional grid background. Or you can try online layout tools such as FloorPlanner and SmartDraw. If using a paper schematic, attach it to a piece of poster board or foam core. Then overlay a piece of tracing paper. This lets you sketch and play with different shelving and equipment arrangements without marking up your original. I’ve even used paper cutouts to represent shelving and work tables and moved them around to test different layouts. If you use the online layout tools above, you’ll be able to move these elements around on your screen, then print out your plan. Whichever method you choose, make sure you’re working with accurate measurements. That means measuring off the interior spaces yourself. Why is this important? In warehouse space planning, which we’ll discuss in the next section, you need to take every inch into account. If your measurements are off by as little as six inches in spots, when you start installing your shelving, equipment, or workstations, you’ll end up with some tight areas. Losing those inches here and there can impede traffic flow and hamper productivity. So pull out a distance tape measure or rolling tape measure to take accurate measurements from the start. Once you have a printed or online schematic with measurements drawn to scale, note any stationary features such as columns or supports, office area build-outs, installed equipment, overhead doors, etc., that you’ll have to work around. Once you have your schematic ready, with your major features noted, it’s time to start planning your space. How you lay out your warehouse space depends on how you’ll use your warehouse. So give your usage and processes plenty of thought as you look at your schematic and plan your work areas. Now let’s take a look at how your business needs dictate your warehouse space allocation for these elements. Your key units might be equipment or workstations. Whatever they are, you need to identify and place these elements on your plan first. If manufacturing is your business, then your primary concern is designing your space around equipment and adjacent production workspace. Storage spaces, while important, are secondary in your plan, and dependent on where you place your equipment. If your warehouse is primarily stock and ship, like my ecommerce company, then stock storage units are your primary equipment, as shown above. These, usually in the form of shelving or bins, likely will take up the majority of your space. After that, allocating workspace for order packing and shipping, and stock receiving are your major concerns. If you do light assembly paired with some shipping, assembly stations or light manufacturing equipment are likely to be your your primary focus. After that, you’ll need to address storage space for parts and finished goods, plus adequate packaging, packing, and shipping areas. Next we’ll examine the things you need to consider to create an efficient workflow around the key elements in your warehouse. After addressing primary units like equipment, stock shelving, and/or assembly stations, the next step is thinking about how workers, materials, and goods move in and around your key elements. You also need to consider the space needed for your production work to safely occur. This is especially important in manufacturing, where you have materials movement around equipment. But safe workflows apply to all types of operations, so it’s important to include adequate production zones and workflow areas on any warehouse layout plan. For manufacturing, that’s the work area around each piece of equipment. You’ll need to allocate space for any workbenches, bins, tools, safety stations, etc., needed for production. Plus you’ll need to reserve adequate production zones around equipment for workers to move materials and safely produce goods. For a stock and ship operation like mine, one primary work area is the aisle space between shelving units, as shown below. This is where you or your employees need adequate space to stock received goods and pick items for orders. You’ll also need to allocate workspace for employees to move goods into, around, and out of the production zones, which are your packing, shipping, and receiving areas. Assembly operations often combine the space needs of manufacturing and stock and ship. Assembly stations and related equipment make up the heart of your production zone. 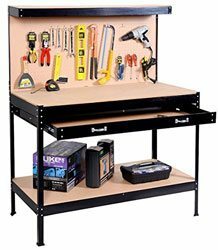 These can include workbenches or specialized stations, plus any needed bins for parts and finished goods. Like manufacturing, you’ll need to allocate ample production space around these areas. Then, like stock and ship, you’ll need to reserve space to efficiently package, pack, and ship finished goods. Next, we’ll look at how you’ll keep all of your materials and/or salable goods organized and readily accessible. Speaking of storage and production spaces, now let’s take a look at your many choices in shelving and workspace fixtures and equipment. 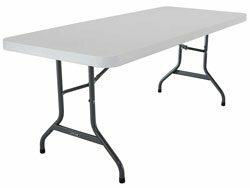 Most small business warehouse operations, whether manufacturing, assembly, pack-and-ship, or a combination of all three, need some form of storage and workspace equipment, such as assembly tables or packing stations. Here you have many options and, as stated above, the storage you need greatly depends on what it is you do. When planning your warehouse layout, the size and type of storage, shelving, and workspace equipment all comes into play. Here’s a look at the most common types of shelving used for various small business warehouse needs. We’ll discuss each option in detail below. While you can track down each of these items from various sellers, you can get most of them at much lower prices on Alibaba. As one of the largest global marketplaces, Alibaba lets you buy shelves, racks, work desks, and more directly from hundreds of manufacturers at prices lower than retail. Join for free today. Pallet rack is useful for many business needs. It’s called pallet rack because it’s designed to store pallets of goods. But it’s also great for stocking all sorts of products and materials, large and small. 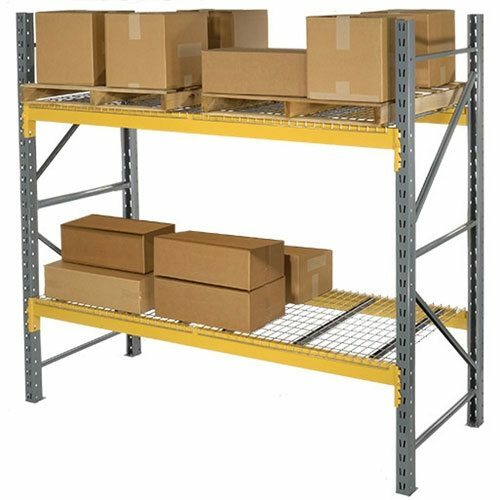 One nice thing about pallet rack is that large goods can take up the full shelf depth, while smaller goods can take up a portion of the depth. This makes it useful to run aisles down either side for small stock storage, which is how I use it in my warehouse. 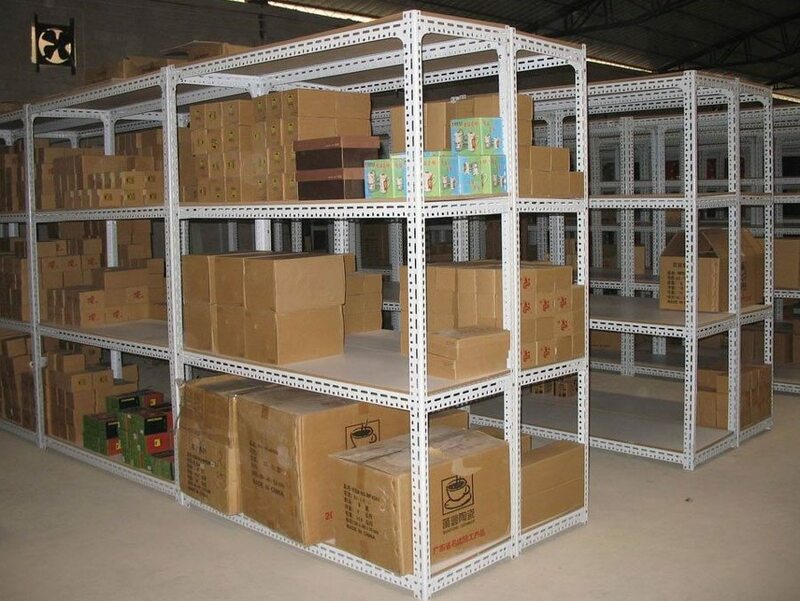 Versatile pallet rack is assembled using end units called uprights, adjustable crossbars called rails, and heavy-duty particle board or metal wire grid shelves called decks. You can have many shelves or just a few on each unit. Pallet rack can be freestanding, but it’s really designed to interconnect for long shelving runs. 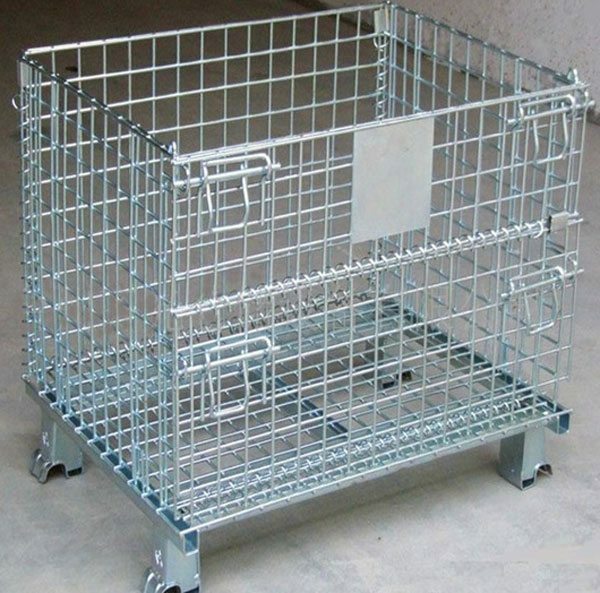 Used this way, it’s the most cost effective shelving solution for large storage areas. If you have storage space of 1000 squate-feet (around 20’ x 50’) or more, two long rows of pallet rack can provide ample storage at a reasonable cost. 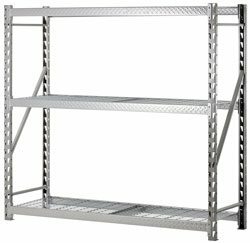 This is pallet rack’s baby brother and is a great shelving choice for light to midweight storage in smaller warehouse spaces, storage units. and garages. 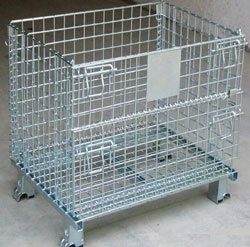 It usually comes with three adjustable heavy-duty particle board or metal wire grid shelves. 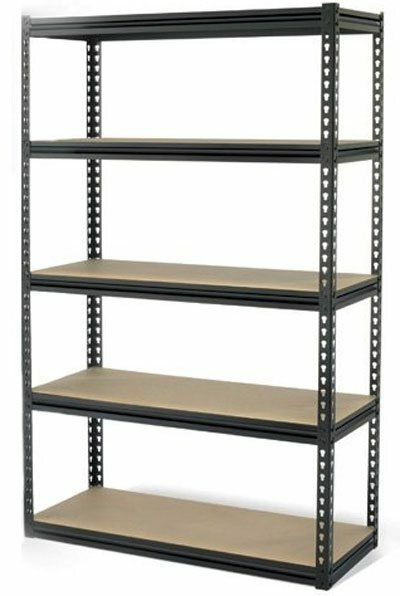 Heavy-duty shelving is a good choice to combine with stacked parts bins, discussed below, for stocking small items and assembly parts. 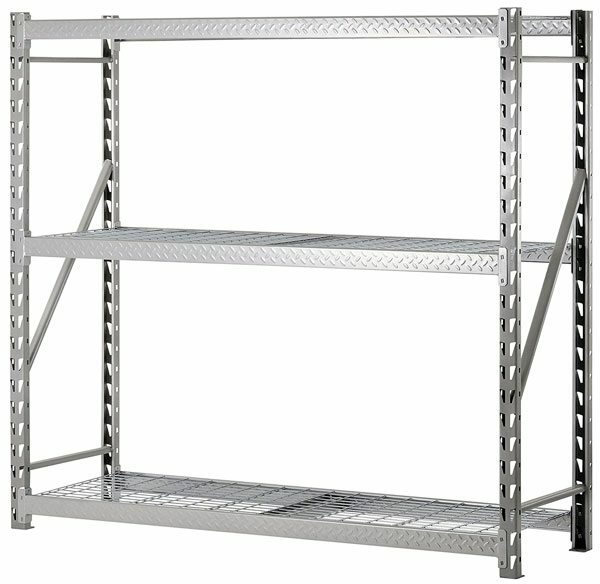 This shelving is commonly used in garages, small retail store rooms, and residential storage areas like utility and craft rooms. It’s an inexpensive choice for light storage in small warehouse spaces, storage units, and garages. It usually comes with five or six adjustable shelves. 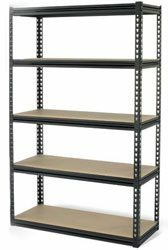 Light duty shelving also works well with stacked parts bins, discussed below, for stocking small items and assembly parts. 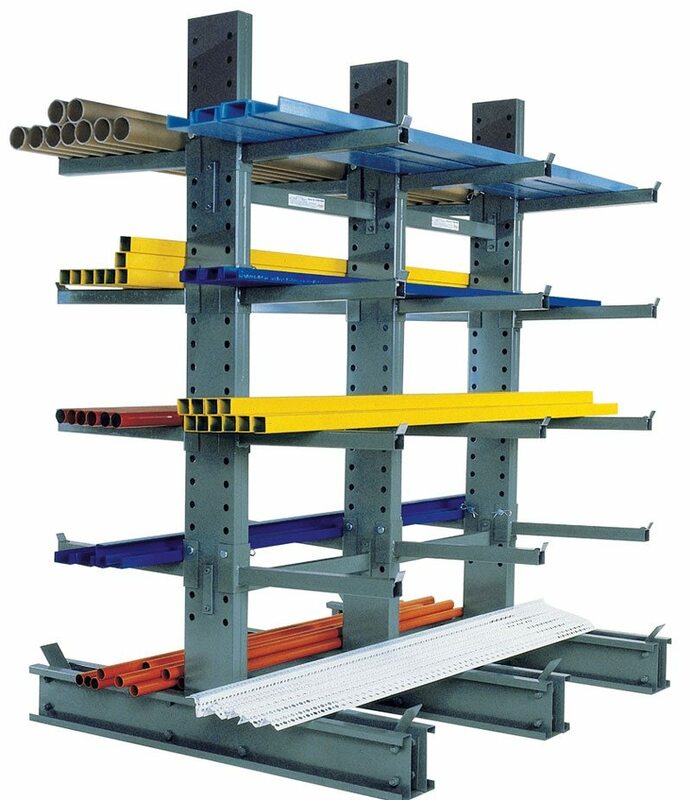 Cantilever rack, shown above, can handle pipe, lumber, and other oversize material storage needs. 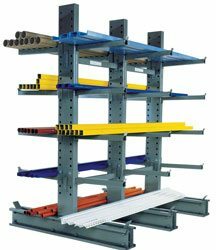 If you have a storage need that regular shelves or cantilever racks can’t handle, or need a unique size or wall-mounted solution, contact a used warehouse shelving dealer. They have an amazing array of unique storage solutions. Most sell both used and new stock, too, and can even custom-cut shelving to fit specific needs. Space to Allow in Warehouse Plan: Varies by footprint, common allowance is a pallet size: 40” wide x 48” long x various heights. Comes in smaller and larger sizes. Bins, hoppers, and barrels are very common in manufacturing and assembly operations. Many businesses move these on pallets using pallet jacks, but some bins and hoppers are wheeled. Average cost: $-$$ Varies by unit, size & material. 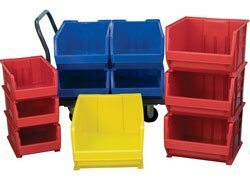 Stackable parts bins range from under $1/ea. to more than $10/ea. 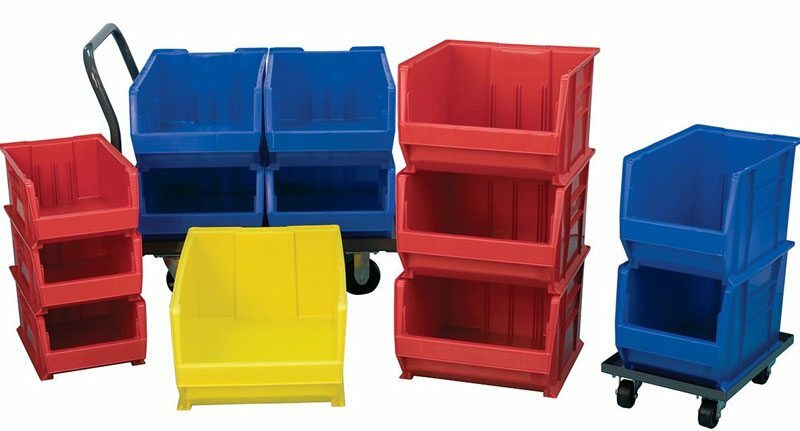 These handy stackable bins are ideal for storing small items for all sorts of needs; materials for manufacturing, parts for assembly, and small goods for pack and ship. Plus their easy-access design makes them an efficient alternative to stocking small goods in closed boxes. So, we’ve explored the major space considerations in warehouse layout planning, namely the various equipment, storage units, and workspace fixtures you might use in your operation. Whether your business centers on manufacturing, assembly, or pack-and-ship, or a combination of all three, you’ll likely include some combination of these elements on your warehouse schematic. Next it’s time to see how to combine these elements together in your warehouse layout to create an efficient workspace with a sensible, productive traffic flow. You have a good idea of what’s going into your warehouse space, and a rough idea of where it can all fit in your warehouse layout. Now it’s time to really drill into your warehouse schematic to arrange every element into an efficient, productivity-boosting traffic flow. Where do you or your employees spend the most time in the warehouse? 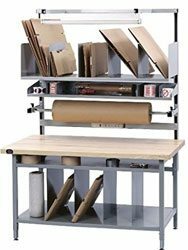 Around which elements — manufacturing equipment, storage areas, or worktables, does most work center? What things do you or your employees need to move, gather, or have close-by to complete daily tasks? The answers to these questions will help you lay out work areas and traffic patterns within your warehouse. Every business need is different, but here’s an example of a good traffic pattern based on my company’s pick, pack, and ship workflows. Below, I’ll note the key traffic features I address during planning, and why my warehouse layout solution works. This allows warehouse staff to quickly access product on either side of the warehouse. Plus, each employee is assigned a specific section to pick and maintain, which keeps them from bumping into each other. All of this culminates in an efficient traffic flow. I maximize our stock storage areas by using 12’ tall pallet rack that allows ample overstock space on upper shelves, out of the daily workflows. Plus, we use hand-carried bins and small carts for restock and order picking tasks among the shelves. 4’ aisle widths suit our large box and cart-moving needs. I leave ample space for pallet movement along the central aisles since we receive and ship palletized freight, too. Note that I don’t place our shelving against the endwalls, and instead run 2’ deep shelving along the perimeter for smaller items. This enables pickers to move from aisle to aisle without backtracking, and to pick small items along the way as needed. Packing and shipping is the primary goal of my ecommerce operation, so ample space is dedicated to these tasks. In the central packing area (B), I use a mix of 8’ and 6’ utility tables that can be moved and rearranged as packing needs dictate. This lets us handle daily parcel packing with room to spare, easily accommodates holiday volumes, and allows us to pack pallets for large freight orders. As a pack-and-ship operation, we store shipping boxes and packing materials in easy reach of the packing tables. Once parcels are packed, they are quickly moved to the nearby shipping station table for weighing, sealing, and labeling. If you plan on shipping daily, allocating space for a dedicated shipping station is a real time-saver. If you’re planning out a shipping operation, our order fulfillment and shipping guide explains the entire fulfillment and shipping process. You can also get an overview of all types of branded packaging in our creative packaging article. I allow ample room by our large overhead doors (C) for both shipping and receiving stock. As a pack-and-ship ecommerce operation, we receive numerous freight and parcel stock shipments daily. Allowing room to store received stock prior to unpacking is essential. Plus, it’s helpful to keep receivables separate from daily outbound parcels to prevent confusion and carrier pickup mistakes. With 12’ shelves, we use a rolling staircase to safely manage large numbers of overstock boxes. So that’s a space consideration I have to include (D, by Receiving). 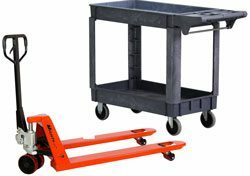 Plus we handle palletized freight daily and use not one, but two, pallet jacks. These I tuck away in the reserved pallet storage areas. Thank goodness our neighbor has a forklift for our occasional needs, or I would have to allocate valuable space for that, too. Rolling ladders and pallets jacks are things to keep in mind when planning your warehouse layout. If you don’t have them now, but think you might down the line, plan for it now. Believe me, once you get your equipment situated or rows of shelving installed, you don’t want to move them to make space for pallet jacks and such. The last step before you start installing equipment, shelves, and tables is to walk your finished plan. To do this, measure off the space and apply masking tape on the floor to mark the positioning of your main units, be they equipment, tables, or shelves. You don’t need to do this for every piece, but definitely do it in your key workflow and production zone areas. Then walk the space as though you’re working in it. Carry boxes, tools, or materials. Do you have plenty of clearance? Roll carts or pallet jacks through the space. Can you make the turns? If you have employees, get them involved in acting out work processes. Do they run into each other? If you have a large space that will house equipment or large shelving units, don’t skip this step. Believe me, it’s far easier to make traffic flow corrections at this stage before the heavy stuff arrives. Your business’s needs likely differ greatly from mine. But if you put some thought into your planning and testing process, you’ll be rewarded with an efficient, productive space, no matter your size or operation. Installing equipment and setting up aisles of shelves in a warehouse is quite a task. Believe me, it’s one that you don’t want to repeat because you didn’t start out with a sound layout. Warehouse planning doesn’t have to be difficult at all. 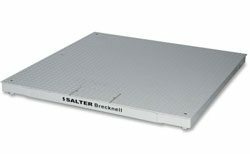 Simply start with a scale-drawn schematic based on accurate measurements of the inside of your warehouse. This is your blank slate. On this you can examine, move about, and test the placement of every element needed to do your work. And if you’re not already starting out with stacks of shelving, worktables, and equipment to fit into your new space, play around with our suggestions above to see what best suits your unique needs. Then, when you know what you’re going to put in your warehouse, give plenty of thought to where it’s best positioned. 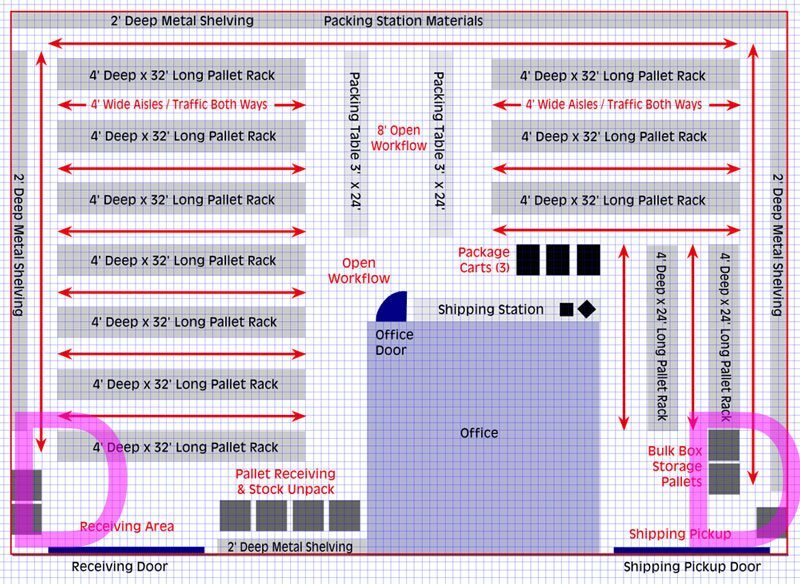 Use your warehouse layout schematic to move equipment, shelves, and worktables around on paper. Test out different traffic flows. Then, when you think you have a sound plan, take your schematic into your empty space. Measure and tape off your major elements and walk around. Move a cart. Carry boxes. Make sure your traffic patterns require as few steps as possible, and that you don’t encounter roadblocks. Once those shelves go up and workbenches are in place, you’ll be happy that you spent time planning and testing it all out. Then you can hit the ground running and get on with business. Not sure managing your own warehouse is the best option for your business? ShipBob provides affordable fulfillment solutions with low startup costs, low shipping rates, and warehouses nationwide so you can offer fast shipping to your customers. Click here for a free quote. Firstly, many thanks for posting such an interesting and useful article sharing your experience and knowledge. I wonder if you could help me by providing some tips and/or information sources about warehousing and pick & pack layout and methods. I’m presently working for a small, family-owned manufacturing company which makes packaging machines. I’m in charge of the technical warehouse where standard parts, bought-out items and a few raw materials are stored. Apart from selling complete machines, one of the major revenue streams is the supply of spare parts and sub-assemblies for routine maintenance, repair and upgrading of existing machines. There are no working procedures in place, everything is done without a method, and naturally this brings out lots of problems, such as delays in fulfilling the orders, missing items, mistakes etc. I’m trying to change their ways of thinking, and to establish a minimum set of operating procedures – one of them is Order Fulfilling. The draft procedure is already prepared and submitted to the manager (still waiting for feedback…). I understand that the highest priority at present is setting up a suitable area for placing the order bins/boxes until they are completed. This may take a few days, as the orders generally include standard parts, components which we must manufacture in-house or order from third-party suppliers, and also sub-assemblies that must be welded or mounted. At any given moment we have in average some 10-20 orders being processed, and the average box size is ca. 40x60x15 centimeters (22x37x12 cm for smaller orders). Parts are temporarily stored inside these open boxes until all items are gathered, including sub-assemblies if necessary, then the parts are transferred to a packing table. These storage boxes are presently kept inside the warehouse (which is absolutely crowded with stuff…) on 1 or 2 wheeled cages sized 120x60x180 cm fitted with 3 shelves each. All this is very primitive and non-professional, and I’d like very much to contribute in order to establish a simple, ergonomic and organized process flow. Could you please be so kind to provide some references in order to kickstart this change? Thanks in advance for you kind support! We have an article coming out that covers the very challenge you’re facing. It’s a complete overview of warehouse shipping and handling procedures with a checklist that covers standard operating procedures from receiving, through stock organization, to shipping. We’re on LinkedIn so I’ll send you the link when it comes out. In the meantime, I think the big problem is your description of the warehouse being “crowded with stuff.” In a situation like this, I try to carve out one space to dedicate to the staging area, which is where you can get a better grip on the organization of those assembly boxes on the cart. Those staging boxes sound like they play a key role in getting orders out the door in a timely manner. Think about how you can get the staff onboard with improving that aspect first, then let’s revisit your plan when I send you the link to the checklist in a few weeks. Talk to you soon! I run a business with candles and grave lights trade (I’m the importer and sell to distributors). I need to expand and will eventually build a warehouse. I try to figure out if it’s better to build a big compact warehouse(30.000sqft) or several smaller buildings? That depends on your needs. Generally, building one warehouse structure is less costly than several smaller, but there are so many factors involved, it’s impossible to say that with any certainty per your situation. If you build one large warehouse that you can subdivide, you can always lease out what you don’t need, then expand into those spaces when ready. Hope this helps! Good luck! Agree on some points. 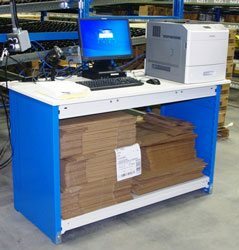 In addition to above, mobile rack cabinets are also helpful to access the products easily and ease inventory management. It reduces time-delay managing huge stock records. Thanks for reading and commenting. Yes, rolling racks are especially good for creating temporary quick-pull stock locations near to shipping areas for promotional items.